The agrarian crisis has taken the form of a civilizational crisis. Successive governments have dismissed the concerns of the farmers. Not only that, they have also been actively complicit in furthering the crisis. Its grave nature is reflected in the suicide of well over 300,000 farmers in the last 20 years. The consequences are no longer restricted to the Agriculture sector alone. India's 'agrarian crisis' has gone beyond the agrarian. We cannot evaluate it through the measure of loss of land or loss of lives. We have lost our own sense of humanity. What is the Agrarian Crisis? P. Sainath defines it in 5 words: Corporate Hijack of Indian Agriculture. Every single sector of Agriculture, except the direct ownership of land, has come under the corporate sector. From fertilizers, seeds, water distribution, pesticides to even crop insurances, the corporate sector is at the helm of affairs and has a critical role in intensifying this crisis. To understand the nuances of this crisis, you can follow our reading list on the agrarian crisis. State, on one hand, helps the corporate sector in snatching lands from the farmers. At the same time, it is also pulling away from the agriculture sector. The corporate friends of the 'honorable' Prime Minister get the all-important contracts for the newly-announced crop insurance schemes. Even the token farm loan waivers announced in the election campaigns undergo bad implementations. The shoddy policies of the central government such as demonetization and GST have only added salt to the wounds of the farmers. This has resulted in farmers getting trapped into a never-ending vicious debt-circle. The lack of a proper policy framework vis-a-vis the Minimum Support Price (MSP) of the crops makes sure that farmers don't even get to cover their input costs. No government has taken up the Swaminathan Commission's report which sought to address the nationwide calamity of farmers suicides in India for discussion. The report looked into the changing dynamics of Indian agriculture and suggested way forward. But, being true to their dismissive nature towards the agriculture sector, both the UPA as well as the current NDA government dumped the recommendations. As a result, the misery in the lives of people involved in this sector has only intensified. The criminal negligence on the part of different governments has galvanized the farmers in actively fighting for their interests. Various parts of the country have seen farmer protests in recent months. As I write this, the Adivasi farmers in Maharashtra are marching to the Azad Maidan in Mumbai against the failed promises of the state government. In the last two years, various farmers' groups and left organizations have resisted the anti-Farmer policies of the current government. In March this year, we had Kisan Long March. 40,000 Adivasi farmers, led by All India Kisan Sabha (AIKS), marched for 200 km from Nashik to Mumbai to force the state BJP government in hearing their demands. AIKS also led a significant farmers' protest in Sikar last year and forced the Vasundhara Raje-led BJP government in Rajasthan to accept their key demands. On 23rd September this year, thousands of farmers, led by Bharatiya Kisan Union, began their march to Delhi from Haridwar. As they neared the Delhi border on 2 October, the police treated them with water cannons and tear gas shells. State has reacted brutally to these protests. We saw that in Mandsaur in Madhya Pradesh where 6 farmers were killed in police firing. The oppression continued in Delhi. Despite this, the resistance must go on. Ensure proper minimum support price for Farmers. 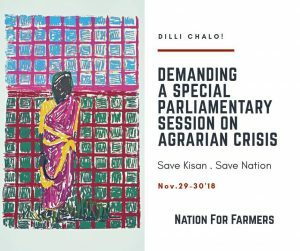 Hold a special 21-day joint session of parliament to discuss the agrarian crisis, hear the first-hand narratives of the dispossessed farmers, and plan a farmer-friendly policy framework for the future. We, at LeftWord Books, extend our support to this March. We will march with the farmers to the Parliament. If you're in NCR, do join us. For more details, visit https://dillichalo.in/. Sign the petition to the President of India. You can also volunteer to help organize the march.